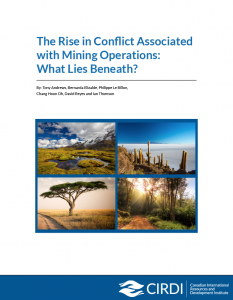 This study explores the nature and root causes of mining-related conflict. A more systematic understanding of conflict can help all stakeholders to apply preventive rather than reactive measures, and to improve approaches to conflict prevention, management, mitigation and transformation. Authors: Tony Andrews, Bernarda Elizalde, Philippe LeBillon, Chang Hoon Oh, David Reyes and Ian Thomson. Read: Executive Summary, Full Report, Literature Review, Case Study 1 – Ambatovy, Madagascar, Case Study 2 – Bulyanhulu, Tanzania, Case Study 3 – Haquira Las Bambas, Peru, Case Study 4 – Minera San Cristobal, Bolivia. Slides: Conflict Study – Tony Andrews, Normative Model – Ian Thomson, Database Analysis – Chang Hoon Oh.